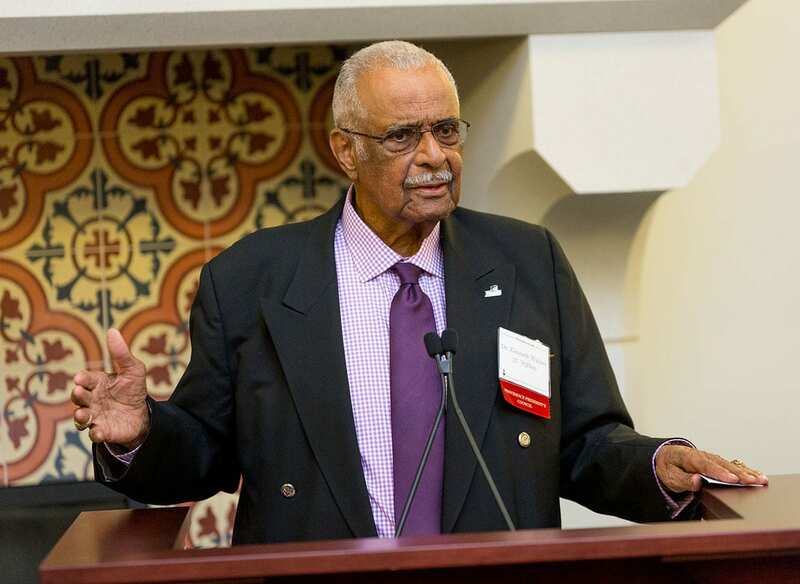 College mourns the death of Dr. Kenneth R. Walker, Sr. ’57 & ’83Hon. Dr. Kenneth R. Walker, Sr. ’57 & ’83Hon. addresses the audience at the annual reception for the scholarship fund in his name in April 2018. Dr. Kenneth R. Walker, Sr. ’57 & ’83Hon., a counselor, mentor, and friend to legions of people at Providence College and the community, died on Jan. 30 at Philip Hulitar Inpatient Center in Providence. Dr. Walker, who grew up in East Providence, graduated from PC as an education major and went on to dedicate his life to urban education. He earned master’s and doctoral degrees in education from Rhode Island College and Boston University, respectively. He was a teacher, coach, guidance counselor, and administrator in the East Providence public school system. He later became a professor of secondary education at Rhode Island College and taught graduate education courses at Johnson & Wales University. 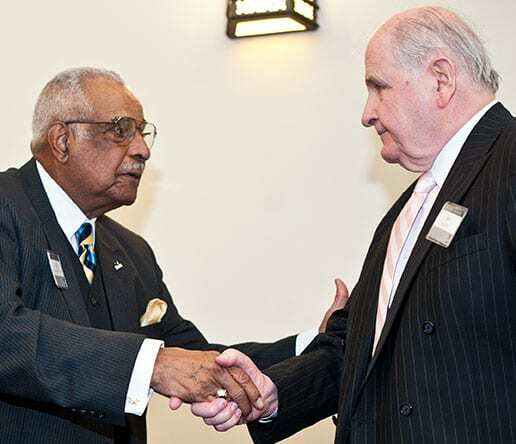 Dr. Kenneth R. Walker, Sr. ’57 & ’83Hon., left, shakes hands with longtime friend John Murphy at a Walker Family Scholarship Fund reception. Murphy established the scholarship. Among his many community contributions and accomplishments, Dr. Walker was perhaps best known for his dedicated service on the Rhode Island Parole Board. He served the board for more than 35 years, including six as chair, earning a reputation for his compassion and sense of fairness, particularly for the circumstances of youths and young adults. At PC, Dr. Walker served as a member of the Providence President’s Council for more than 20 years. A former NCAA and Rhode Island Interscholastic League basketball official, he was a mentor to the Friars’ men’s basketball team. He oftentimes traveled with the team and most recently attended games in Maryland and Connecticut in November. Dr. Walker also frequently attended alumni and College events, and was honored by his alma mater several times. He received an honorary doctor of social science degree in 1983 and was presented with the National Alumni Association’s Exemplary Citizenship Award in 1993. In 2008, longtime friend John Murphy, the founder of Home Loan Investment Bank, FSB, in Warwick, R.I., honored Dr. Walker by establishing the Dr. Kenneth Walker ’57 Family Scholarship Fund. The gesture was made in gratitude for the thousands of people Dr. Walker inspired in the various facets of his life, especially urban youths. The fund provides financial support for African-American students who major in education at PC. President Rev. Brian J. Shanley, O.P. ’80 said the entire College community mourns Dr. Walker’s death, making special note of his President’s Council service and his way of embodying the scholarship fund for minority students that Murphy created. Dr. Walker is survived by his wife, Gail B. (Smith) Walker; two daughters, Leanne Walker-Beard and Michele Walker-Angell; a son, Kenneth R. Walker, Jr.; six grandchildren; a sister, Arline Walker; and a brother, Frank R. Walker, III. A funeral service for Dr. Walker will be held on Wednesday, Feb. 6, at 11 a.m. at the Faith Christian Center, 95 Sagamore Road, Seekonk, Mass. Calling hours are respectfully omitted. Gifts in his memory may be made to the Dr. Kenneth Walker ’57 Family Scholarship Fund, in care of Providence College, Office of Institutional Advancement, 1 Cunningham Square, Providence, RI 02918.